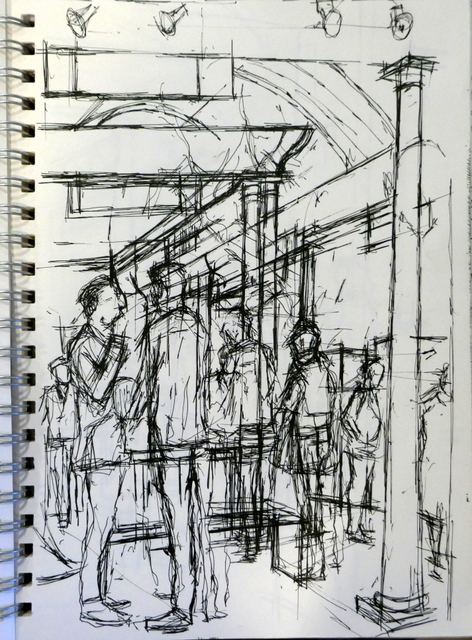 Richard Squire made a welcome return visit to remind us how to draw from a life model. 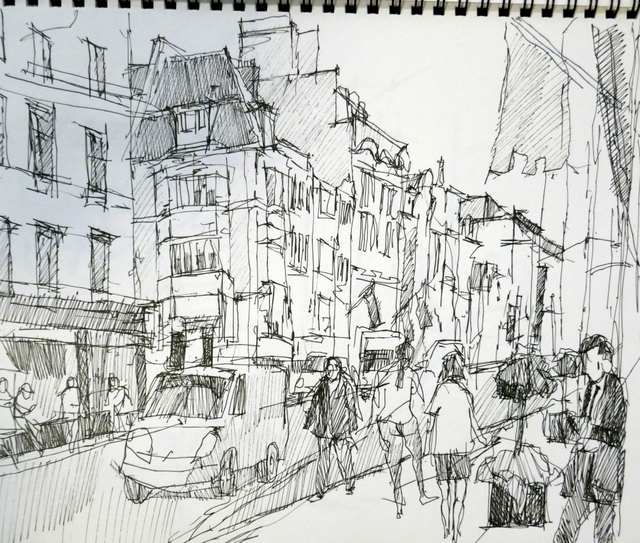 He explained that although there are guidelines to proportion, careful observation of the subject is vital, as each person is different and the angle of view changes the relationship of features and perspective changes relative sizes. l to a drawing or painting. He illustrated with diagrams and sketches how to establish the overall outline of a face or full figure. 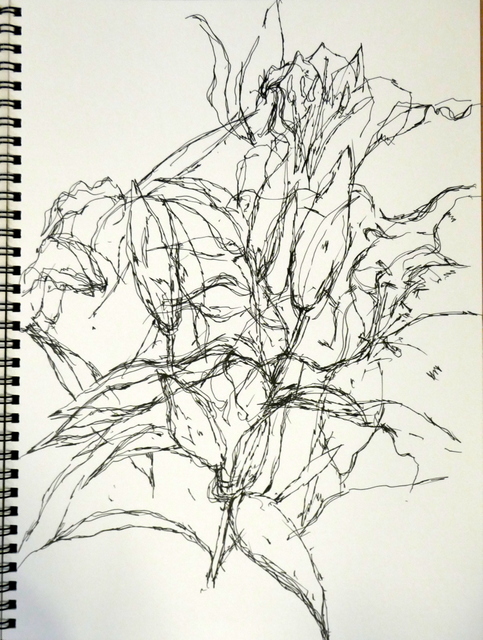 This enables the artist to contain the drawing on the page and be able to divide the space into sensible proportions. He showed how to mark the key angles, such as the eyeline, nose, mouth and chin and the middle vertical of face. Then to place facial features, allowing for how much offset these are with a tilted face. The placement of facial features should be carefully checked at this stage against the original to avoid the difficulty, or impossibility, of later changes. Artists should draw more lightly than he was doing so that changes can be easily made at this stage. The same method applies to the body, establishing the arm and leg angles with a straight centre line and body angles. The proportions are particularly important where the body is angled towards the artist. 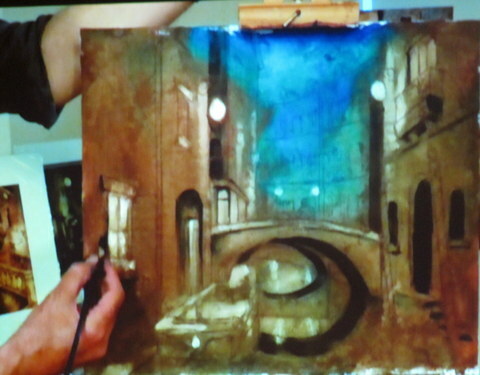 He showed an example of a finished sketch ready for painting. Richard showed us one of his life drawings and two of his portraits. 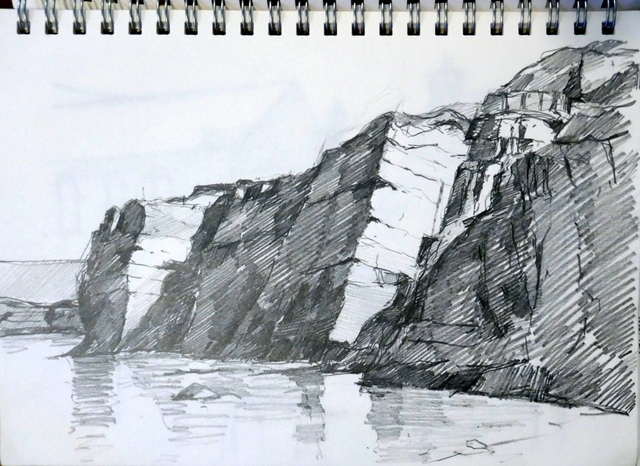 Members worked on their sketches with guidance from Richard. 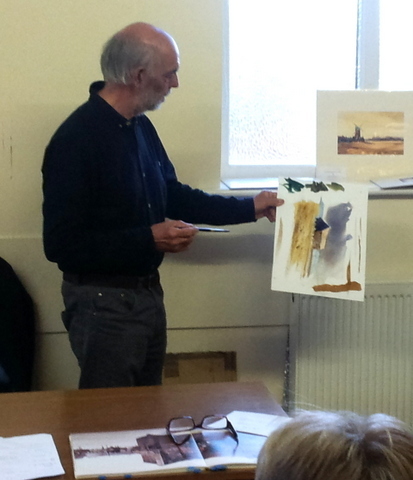 Mr Massie made a return visit to talk about and demonstrate watercolour painting. He recommended that members use the best paper. He uses Bockingford and Saunders Waterford. He often uses cotton paper 140lb, either hot pressed or cold pressed. He suggested that synthetic brushes are adequate and much cheaper than sable brushes. He showed us his sample strips of watercolour combinations that help him plan colour mixes. Before commencing Ian softens the paints on his dishes with a little water. He uses, amongst others, indigo, burnt sienna, permanent rose, yellow ochre, quinacridone gold, neutral tint. 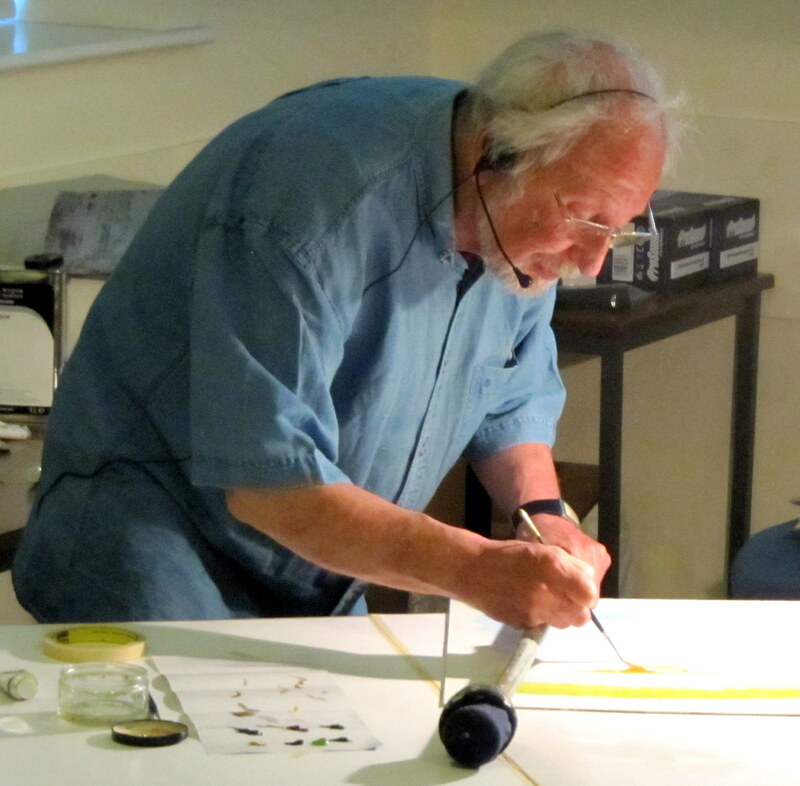 Ian paints flat onto taped watercolour paper on board, tilting his board when needed. Ian used strong pigments and plenty of water to diffuse the colour. 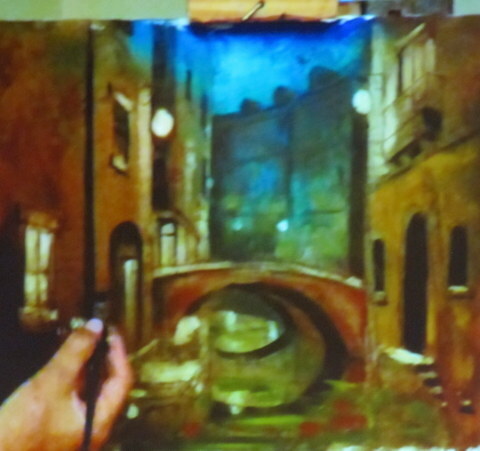 He allows the initial washes to dry before painting the skyline with dark colours with a fine brush. 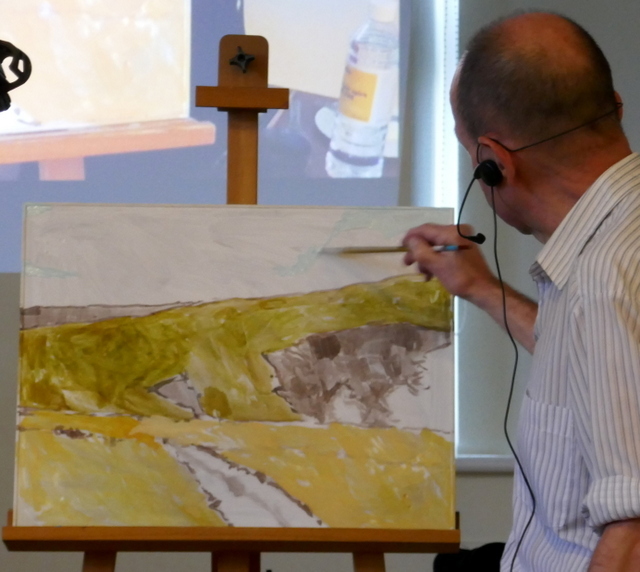 Ian washed the base of the skyline with water to make a soft edge and added some colour into the sea. 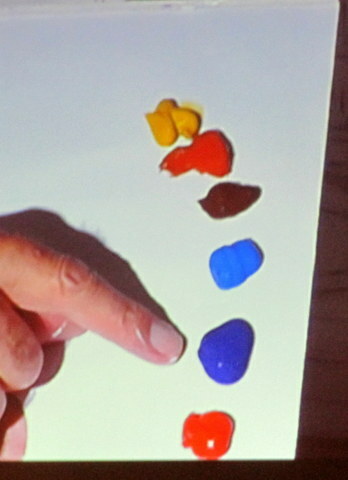 Ian showed us some more colour mixes that he uses for colourful landscapes. 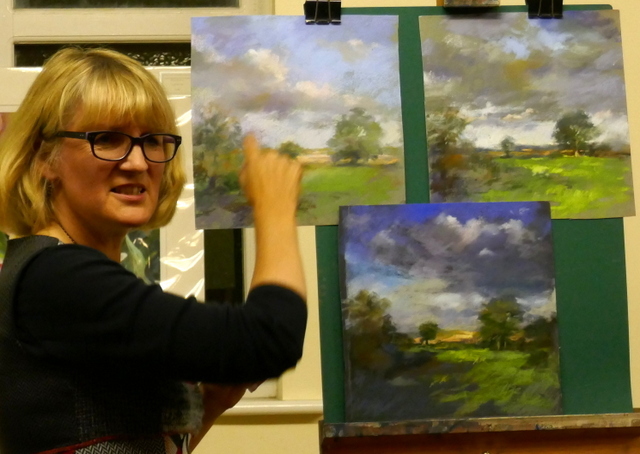 Local artist Helen Cassidy made a return visit to demonstrate how she paints acrylic landscapes. 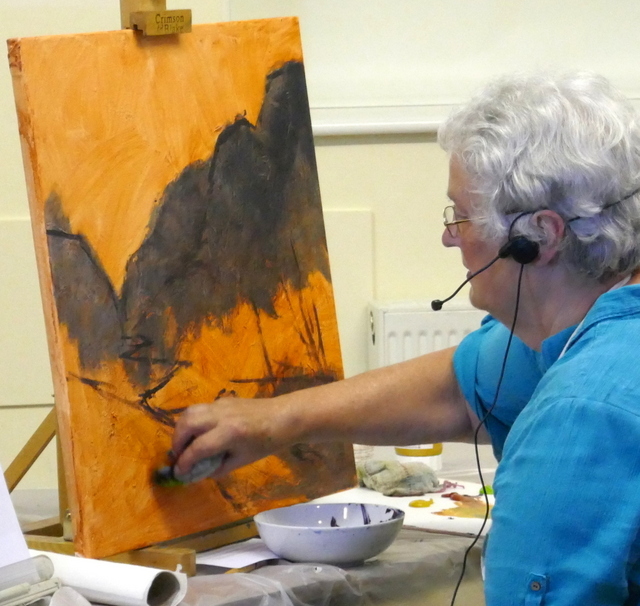 Helen’s used a range of acrylic colours. 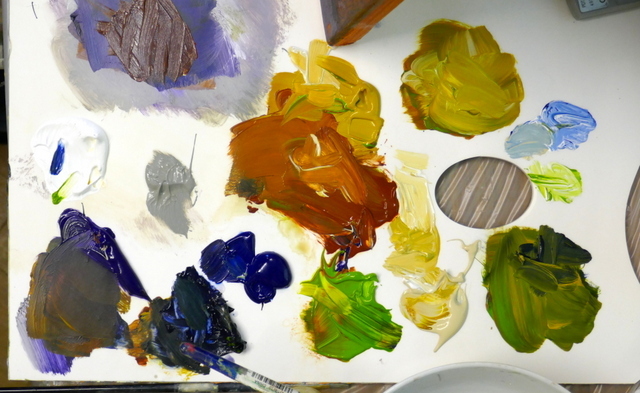 Titanium white, buff, warm grey, prussian blue, indigo, purple, olive green, yellow ochre, burnt sienna. 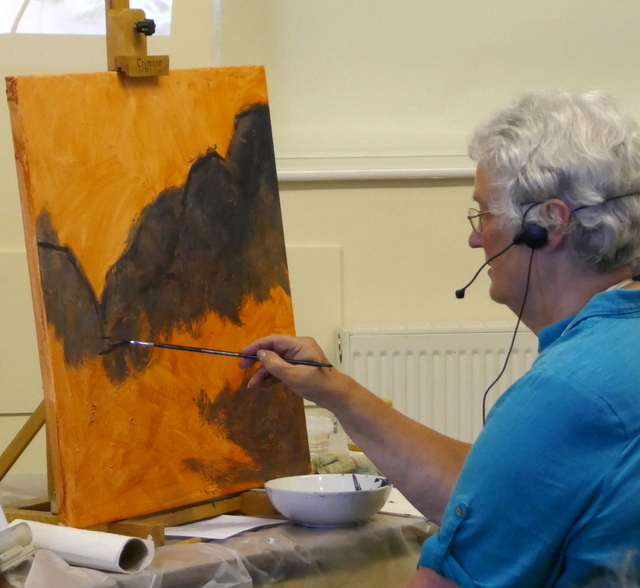 Helen had already prepared a board with burnt sienna as a background, with crumpled tissue to create random texture. 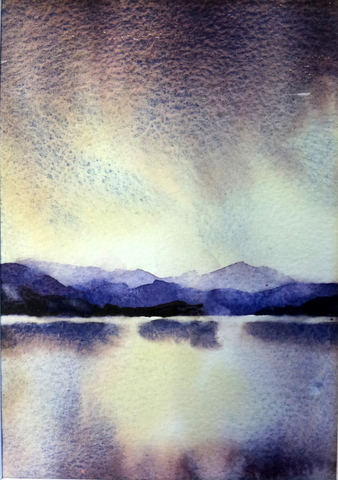 She roughly painted the mountains with a purple/prussian blue mixture. 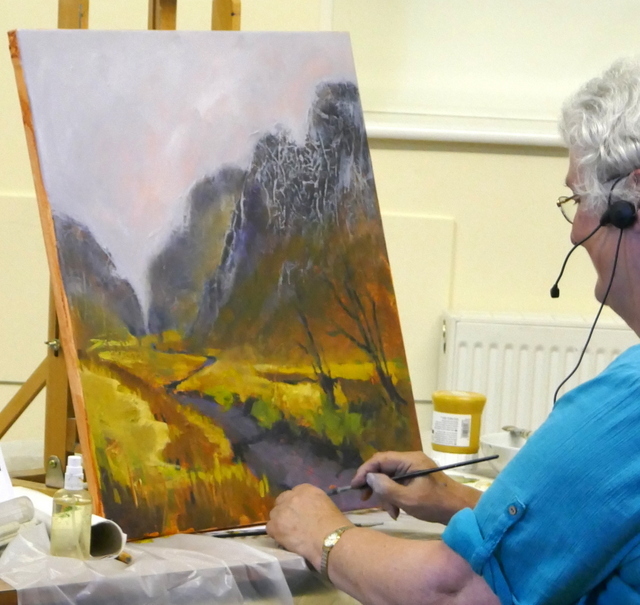 Using a small brush she added dark rock edges and started to paint the dark banks of the river. Helen then used a rag to apply browns either side of the river. She then applied buff colour by rag into the sky. The darker colour showed through a little. 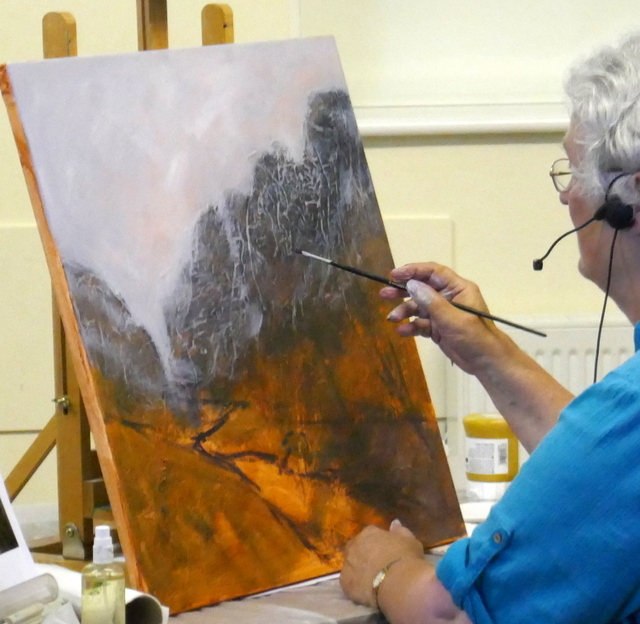 Helen then rubbed the buff on rag over the textured dark hills to produce rocky highlights, then worked in shadow in indigo/purple with a small brush. 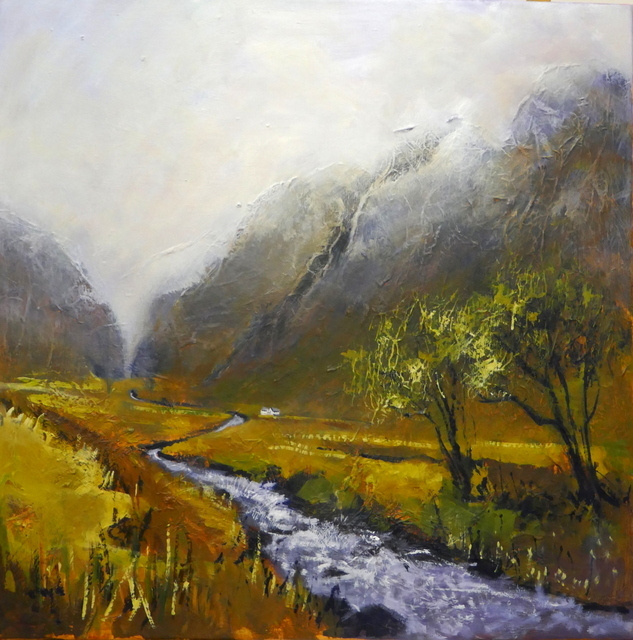 After painting the river loosely in a purple/prussian blue mix, she added various colours to the valley, olive green, yellow ochre and burnt sienna, with a medium brush in a scumble effect. She used darker shades for the lower valley sides. She added growing vegetation with vertical strokes in yellow ochre and added trees in an indigo/purple mix. 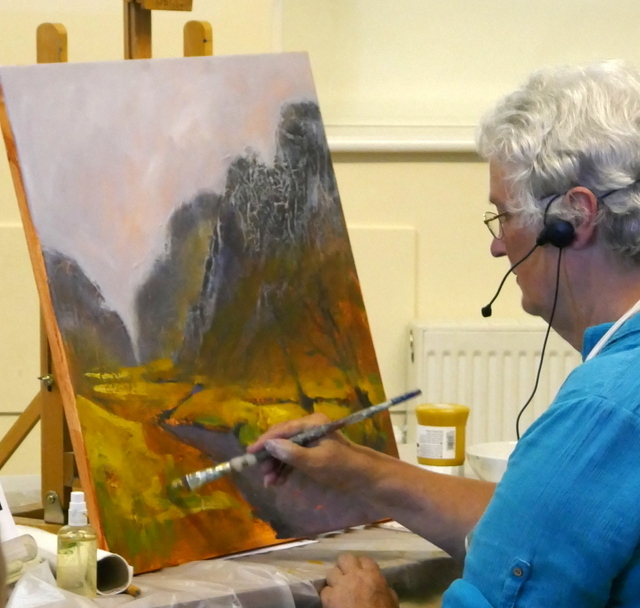 After adding foliage to the trees, Helen painted in an eye catching white house, completing the demonstration painting. 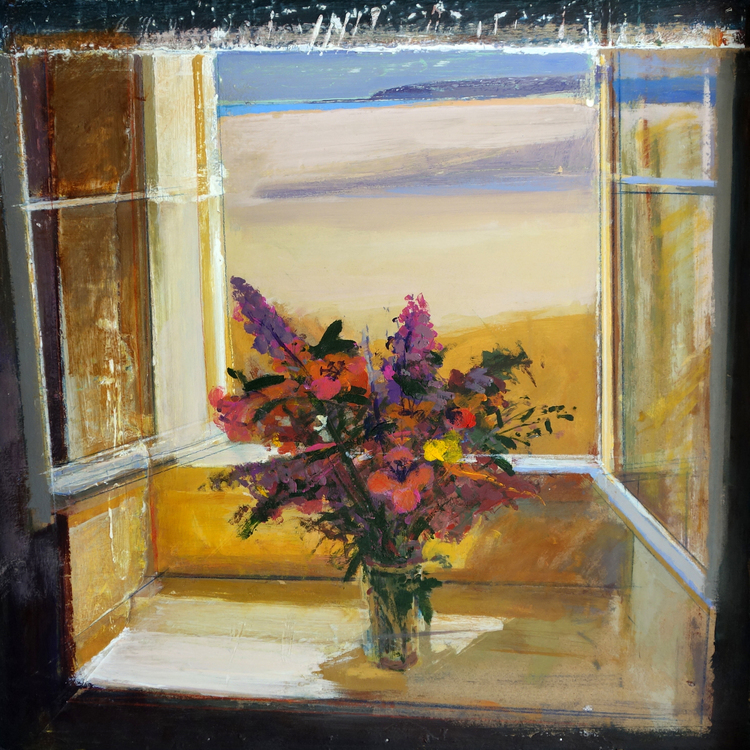 Jeremy Taylor is a Yorkshire teacher, artist and demonstrator who mainly paints in oils and watercolour. 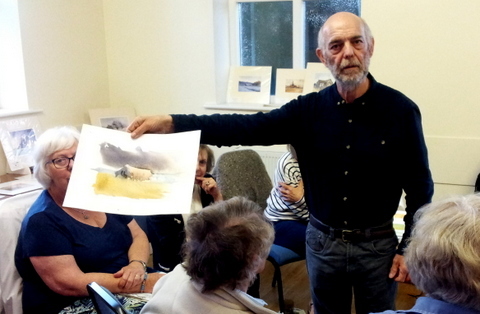 He came to Pateley Bridge Art Club to demonstrate watercolour landscapes. 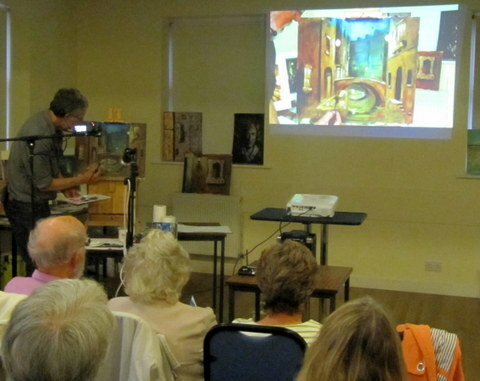 Jeremy explained that he had been painting for many years and was self taught. 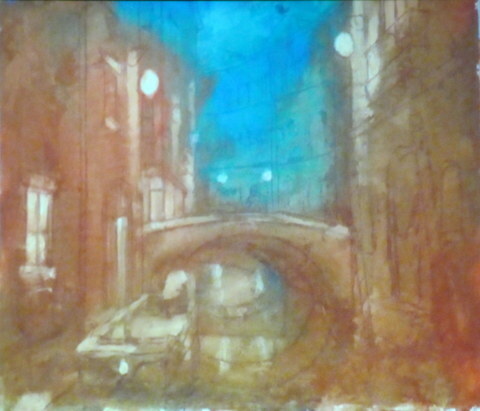 He described how he spends a lot of time thinking about a painting and planning how to do it before commencing. 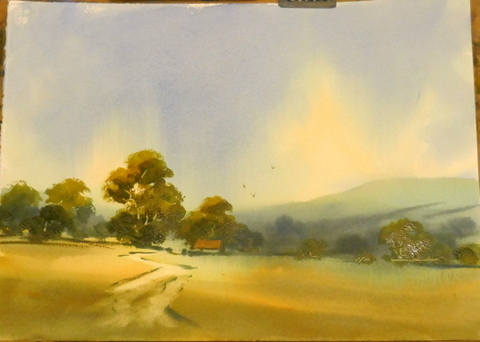 This enables him to paint quickly, avoiding changes that can ruin a watercolour and achieve a fresh look to the painting. Jeremy used 140lb (300gsm) branded watercolour paper, as he believes that paper quality is important to achieving good results. He does not stretch his paper as it frees his approach to painting and encourages him to start again on the other side if it goes wrong. 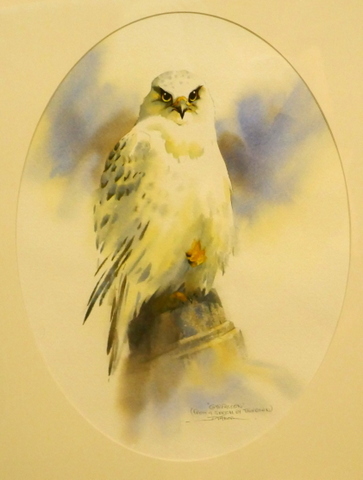 He thinks that this happens quite a lot in watercolour painting compared with oil painting which can be corrected more easily. 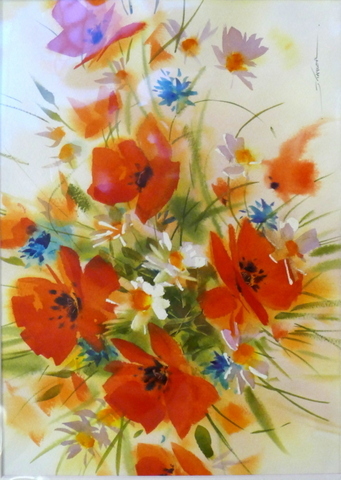 He usually limits his colours to warm and cool hues of the primary colours. 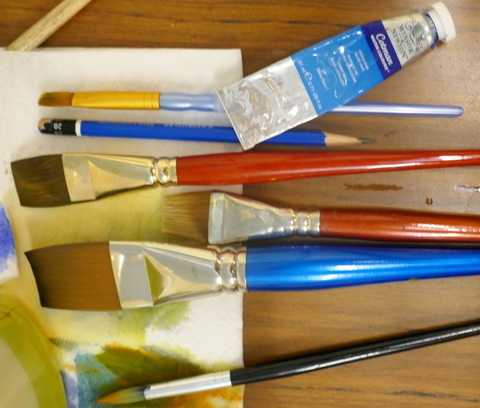 His brushes are usually acrylic, 1.5 inch flat brushes for backgrounds and small round brushes for detail. For his first demonstration he wet his paper thoroughly with several applications of water, then applied sweeping strokes of blue across the sky with his wide brush. 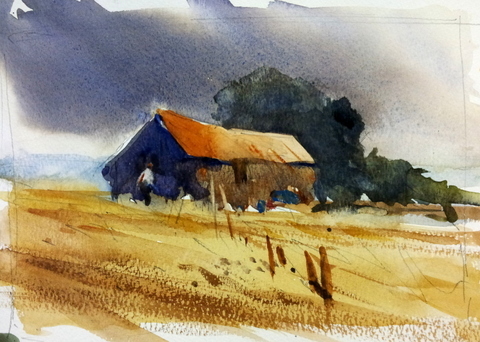 He painted yellow ochre patches and strokes across the foreground, adding darker blue to create lines of hills. He added trees in various shades of mixed green in the mid ground and background and did some scratching out for tree branches using paint tube caps. As a focal point, Jeremy painted a cottage with a warm colour and etched in a path. The photograph under dim indoor lighting does not do justice to the finished result. 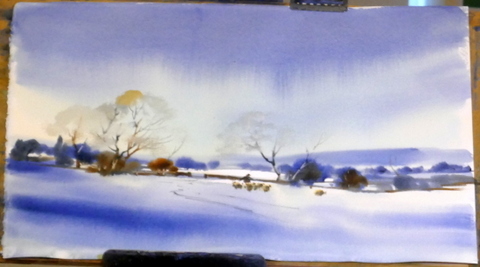 After the break, Jeremy painting a snow scene in limited colours. He wet the paper a little less than the previous painting. He left areas of white paper to show the lighter snow. He washed in blue in various shades. 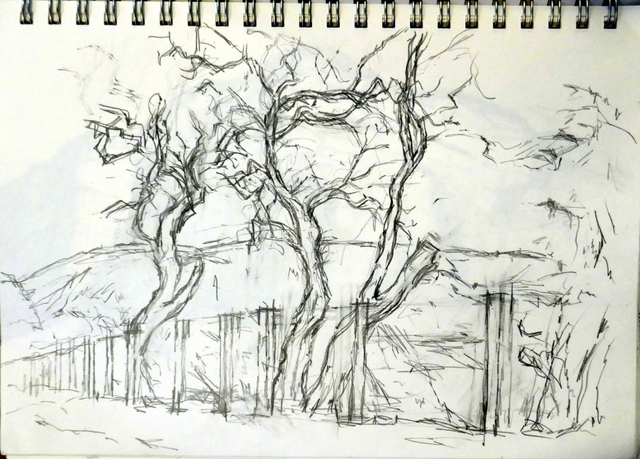 Jeremy added trees lines and walls, then tree branches with minimal strokes and some fine pencil for the thinner branches. The tree crowns are suggested by a light misting of browns and grey colour, avoiding greens. He added a path then a shepherd and sheep create areas of interest that would balance the composition. 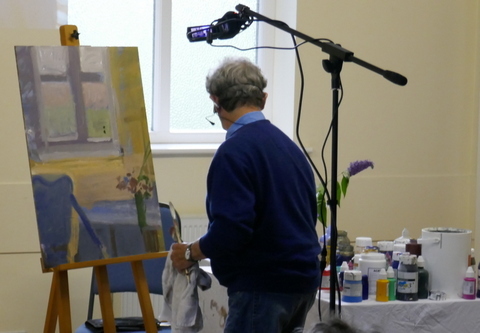 The demonstration showed how results can be achieved with a freer approach to painting. His many suggestions and his dry Yorkshire humour were much appreciated. Jeremy brought examples of his paintings in a wide range of subjects. The following are just a sample. The images again suffer from poor lighting and reflections. All images are copyright of Jeremy Taylor. 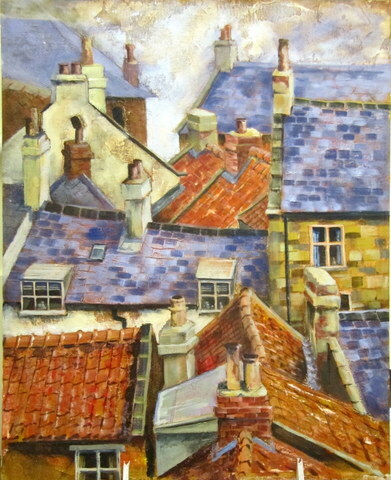 Nel Whatmore is a North Yorkshire painter and designer. 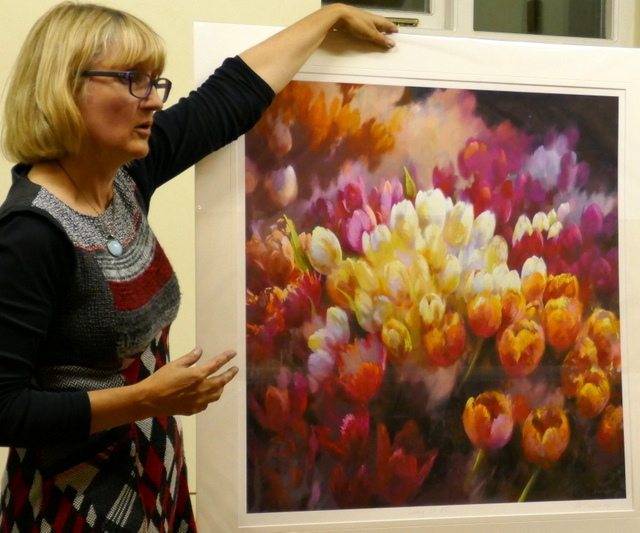 She came to Pateley Bridge Art Club to talk about her background and showed some of her flower paintings, landscape paintings and her designs for manufactured products. Nel talked about her interest in art from an early age, showing us competent paintings at age 6 and 11. 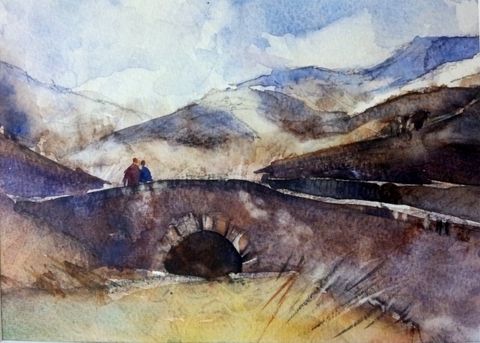 She remained keen on art and chose an option at A level and then went to Art college. 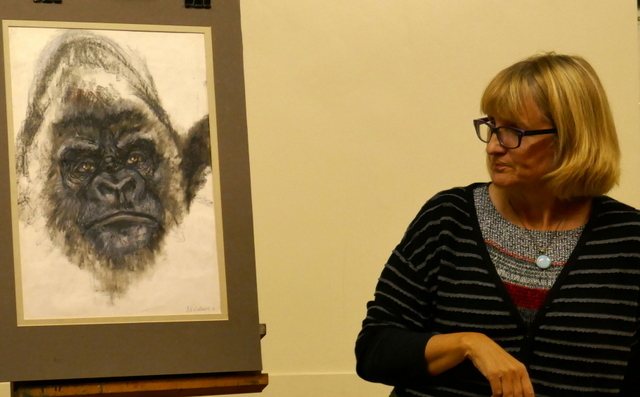 One project was a portrait of a gorilla in oil pastel. He would not stay around or pose until he was at ease with her presence. She explained that a traditional art college did not prepare students for the business aspects of a working artist. For that she sought help from the Princes Trust to start her art career. She thanked Prince Charles personally when he visited her art display at the Chelsea Flower Show. Her art school training did not prepare her for the technical needs of manufacturers who wanted to use her paintings on products. She needed to learn rapidly how to configure images into continuous form for print runs onto fabric and other products. To these are added demands for the same design in other coordinated colours, all within limitations of 18 available colours per design. 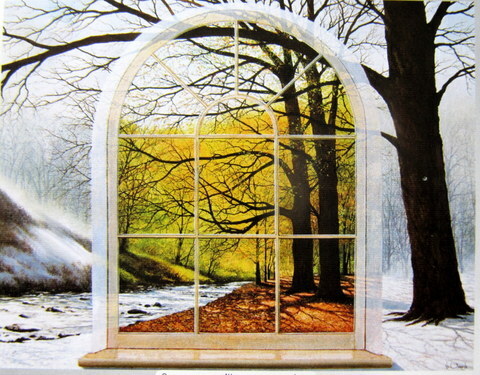 This is illustrated in this adapted painting, showing the colours used. She eventually followed advice from her daughter to use digital means, instead of physical cut and paste, to adapt her designs to meet production needs. 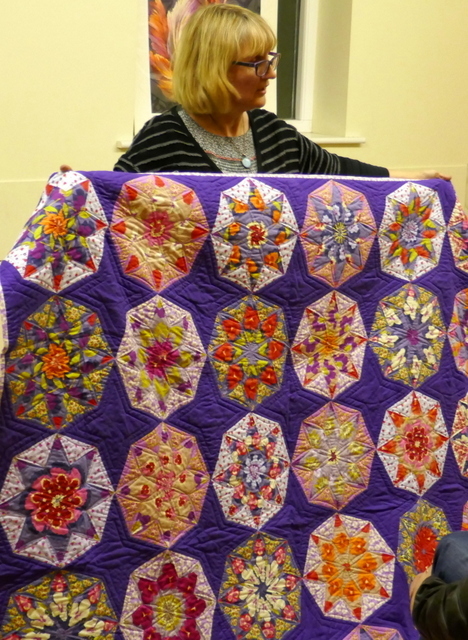 She created this stylish quilt cover by mimicking kaleidoscope techniques. 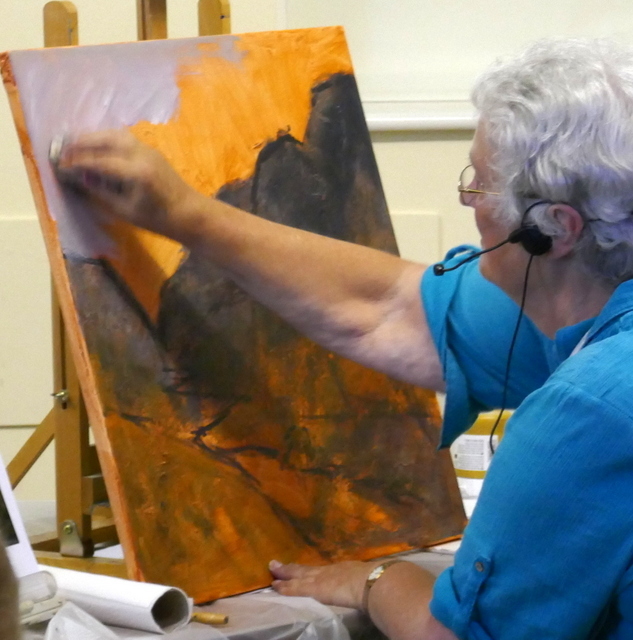 Nel’s main interest is painting landscapes and flowers in chalk pastel. 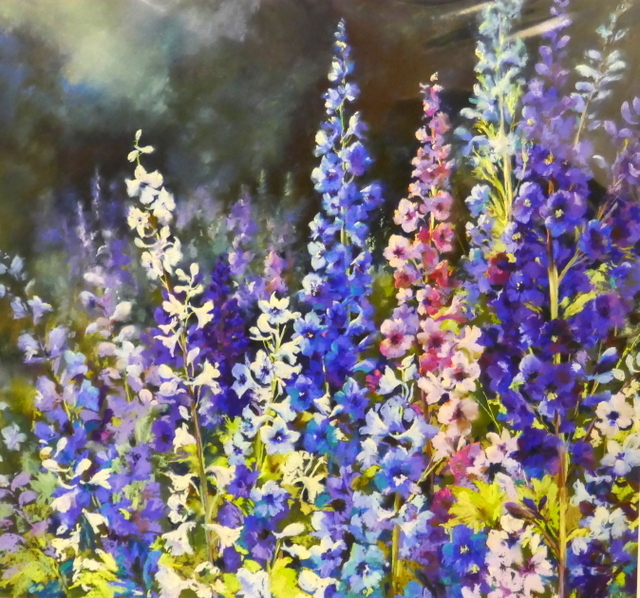 She has exhibited her large flower paintings regularly at Chelsea Flower Show. 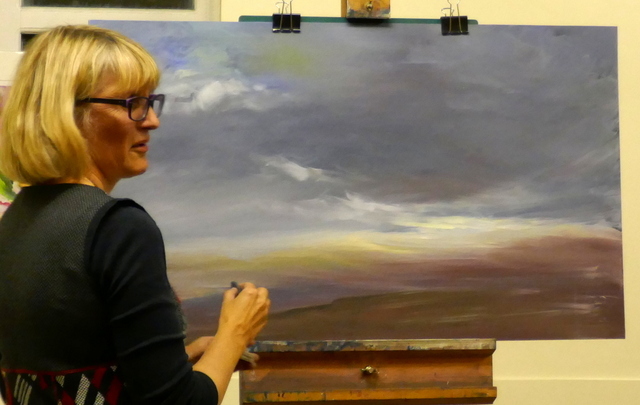 This year she has become artist in residence at Harlow Carr Gardens and also paints at Burton Agnes Hall. 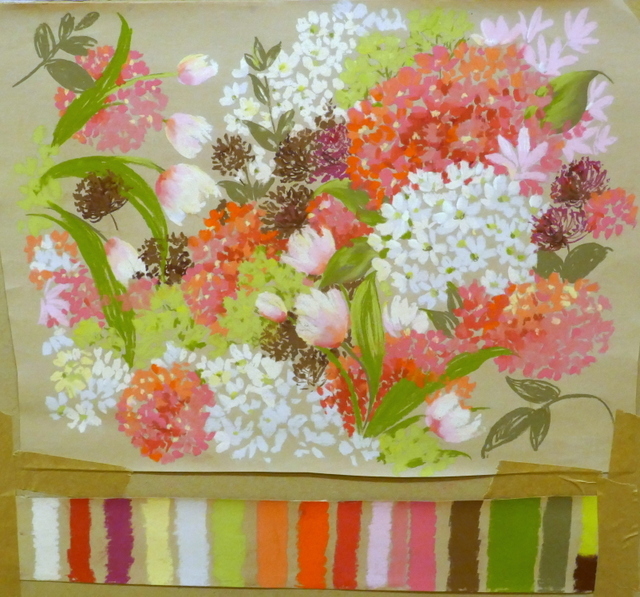 Nel mainly uses Unison pastels; using Sennellier pastels when vibrant colours are needed. 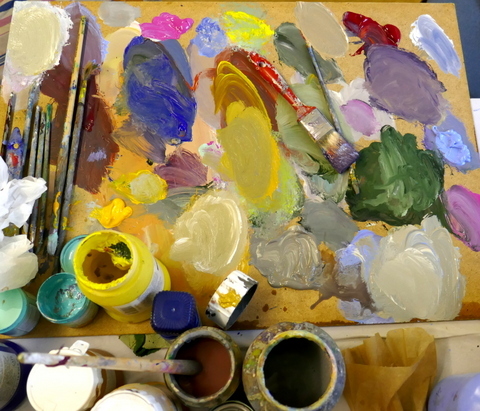 As well as painting on pastel boards, she has to prepare her own boards for her large paintings. She prepares these mainly with Art Spectrum Colourfix primers, which have an acrylic base with fine grit to provide a fine tooth to hold the pastel. Coloured primers can be used to reduce the the amount of pastel needed. These background colours can be varied across the painting, either using the coloured primers or acrylic paints covered by a clear primer. The primers can also be watered down if the pastels are not to be thickly applied. 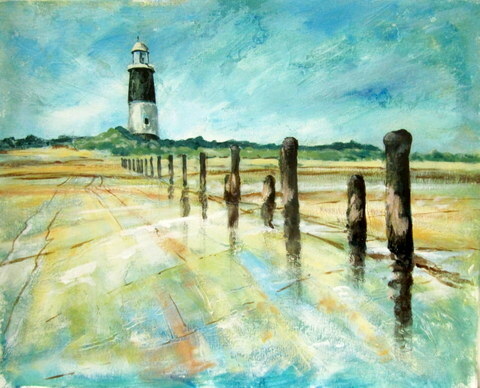 They can also be applied thickly with directional brushstrokes to enhance the effect of the pastels. 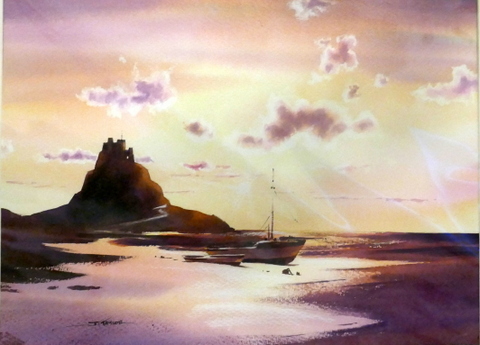 Nel paints landscapes which can often be seen in the Chantry Gallery in Ripley. Nel also uses Pan Pastels applied with a soft flexible applicator. She demonstrated how swirling highlights can be added to clouds. Jake Attree is a figurative painter, sketching and painting from observation. 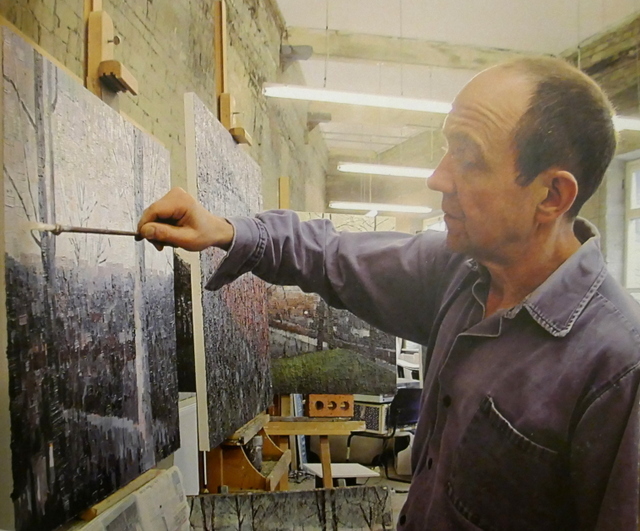 He lives in Airedale and has a studio in Dean Clough, Halifax. 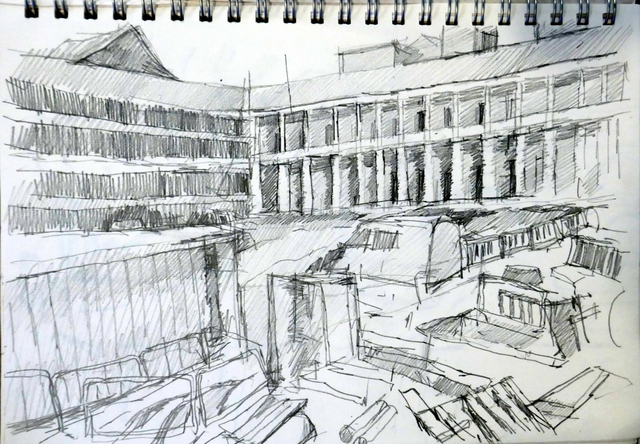 Recently, he was a selector for the Mercer Gallery open exhibition and attended and sketched at the reopening of the Piece Hall, Halifax. 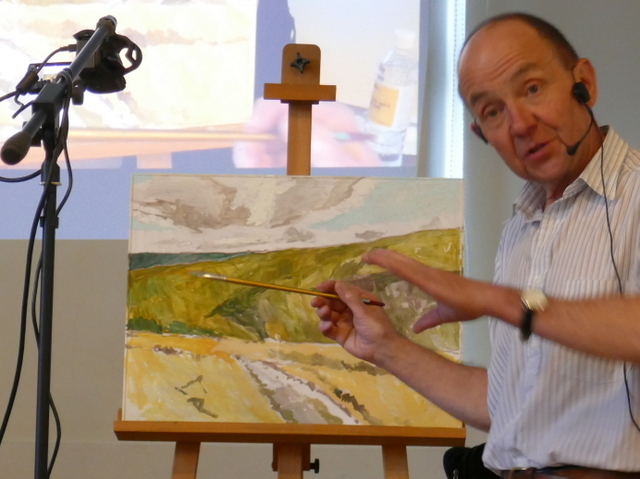 Jake came to Pateley Bridge Art Club to demonstrate a landscape oil painting. As well as commenting on his painting methods, he also commented on the influence of past and present artists and their advice on art. Jake brought a piece of plywood primed in white. 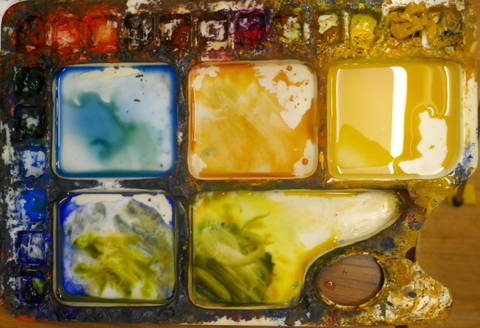 He used a limited pallet of chrome yellow, red, ultramarine blue and white. They were oil paints, based on linseed oil, made by a Yorkshire company. He mixed the paints with turpentine (not substitute), but white spirit could be used. He painted standing, using a small brush throughout, holding it at the end as an extension of his arm. 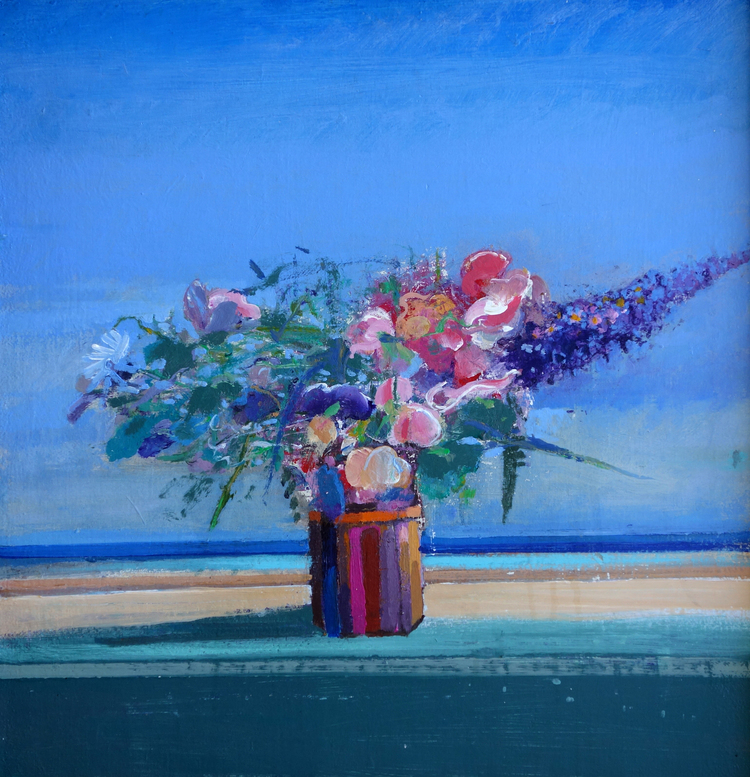 He tended to paint in a series of parallel side strokes to cover each section, moving around the work and changing his colour mix frequently to vary the landscape. 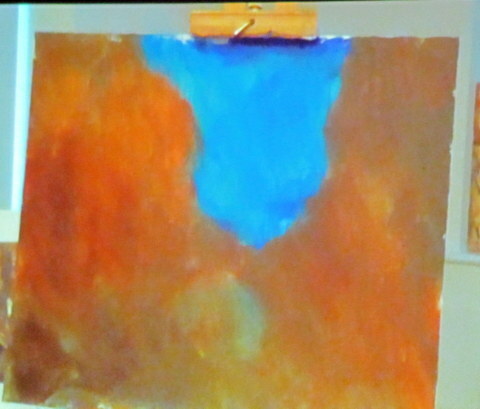 After initial layers to cover the land area, Jake applied blue, grey and white to the sky. Jake darkened the distant hills and the nearer slopes. Jake applied a white mix to the path and lightened other areas. Jake applied various mixed greens and further dark and light mixes to bring out the topography. The picture at the end of the demonstration. Images are copyright of Jake Attree. 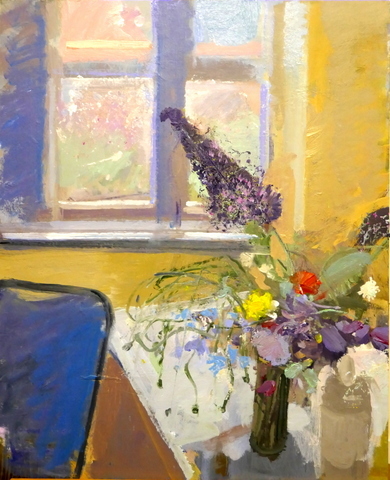 He came to give a demonstration of painting a still life of flowers and window. 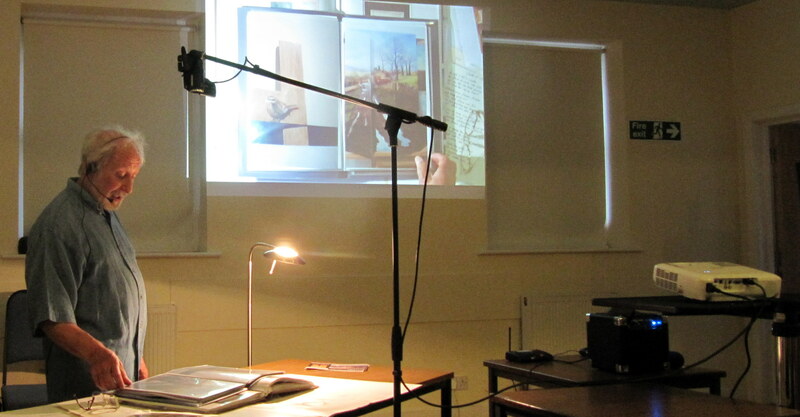 Gordon set up the sound system and camera with a large image projected onto the wall. 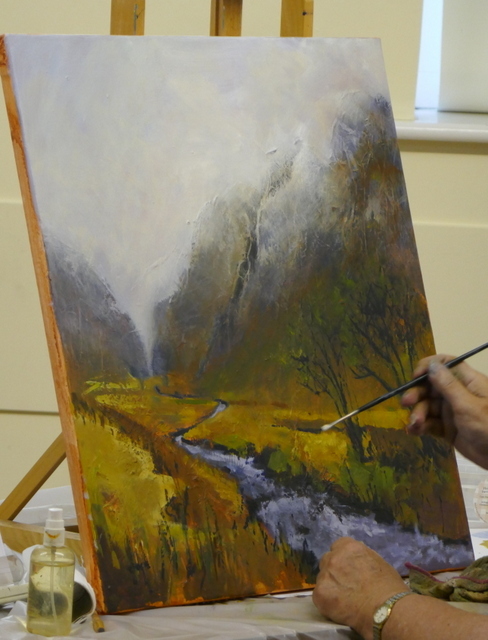 Paul used a variety of artists paints: white acrylic primer, basic System 3 colours and intense specialist colours. Paul painted the background in bold strokes. He made many alterations by added colour or layers to achieve the subdued tones that a feature of his paintings. 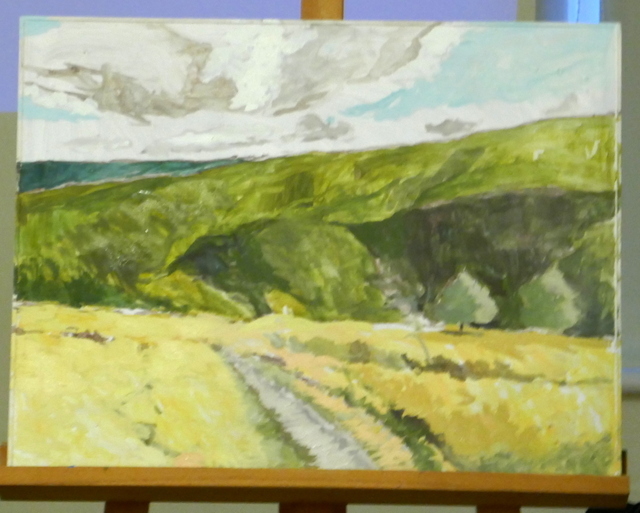 Paul added further layers to lighten the painting as the evening sunlight improved. Paul added the flowers. The dark purple buddleia contrasted with the subdued background. He painted the table cover to provide a light background to show the flowers and stems. 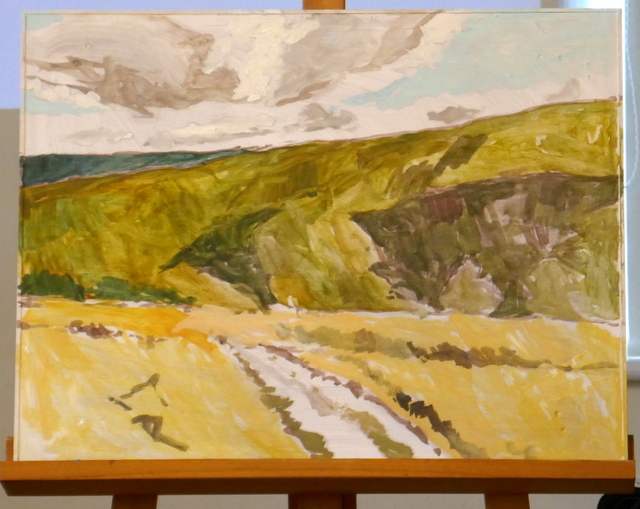 The painting at the end of the demonstration was well on the way to be a finished painting, complete with a familiar blue chair but avoided the radio mast on the hill. 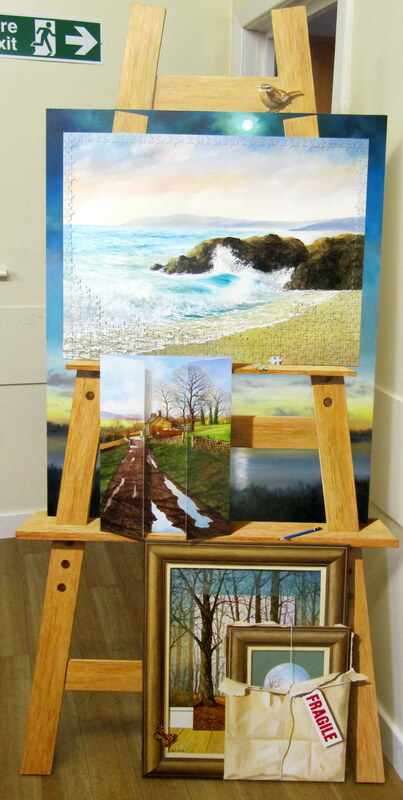 Examples of Paul Curtis paintings from his website. Images are copyright of the artist. Paul Curtis. 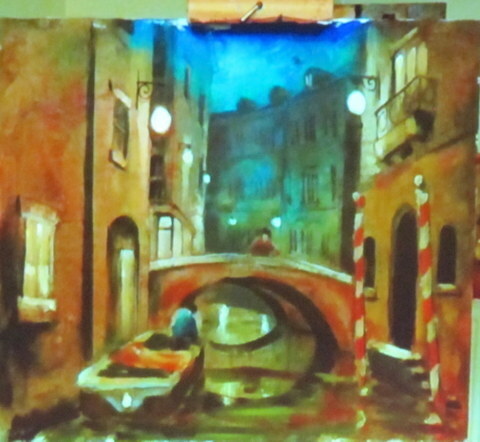 Terry Chipp, a successful artists from Doncaster, came to Pateley Bridge to demonstrate an acrylic painting of a night scene in Venice. 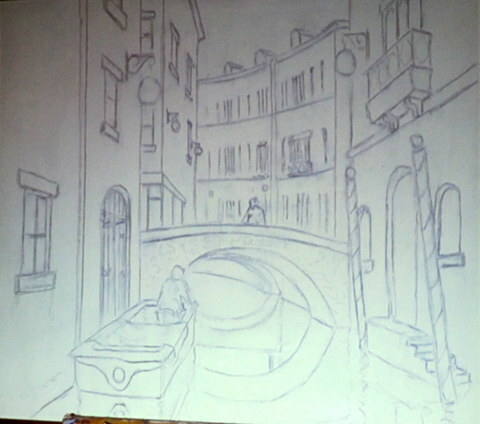 Prepared underdrawing in pencil gouged into an uneven white gesso surface and left to set. After wetting the hard gesso surface, blue paint applied to sky and the background. Wet paint scrapped away to show lights and illuminated parts of buildings. 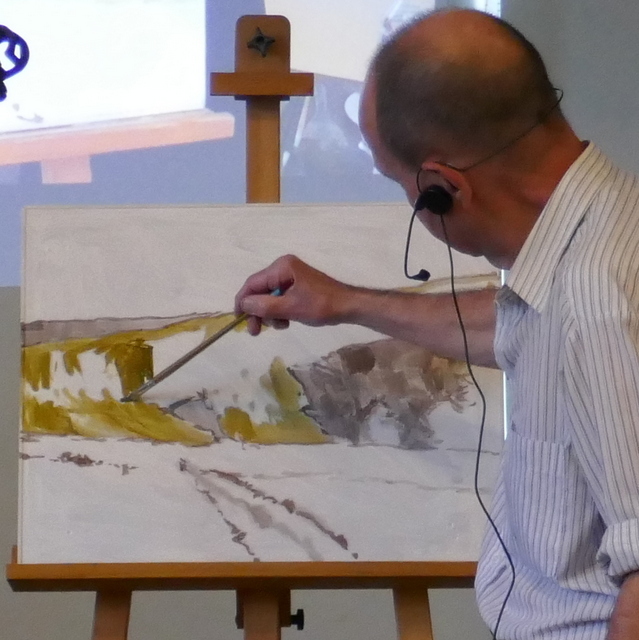 Colin Swinton gave a demonstration of how to create granulating colours in watercolour washes. 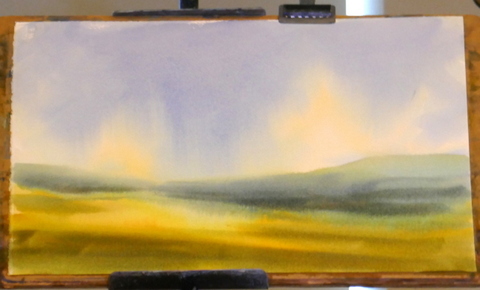 He showed where to use them, how to graduate colour washes and add dry brush strokes. 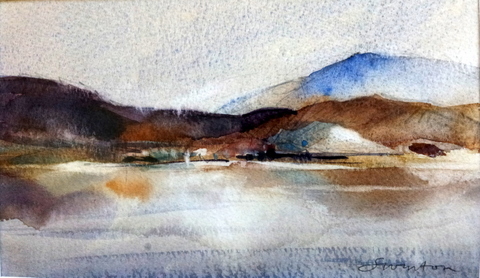 Colin recommended using cold pressed watercolour paper (“not” paper). Rough watercolour paper could also be used. Hot pressed paper and stretched “not” paper did not work well. 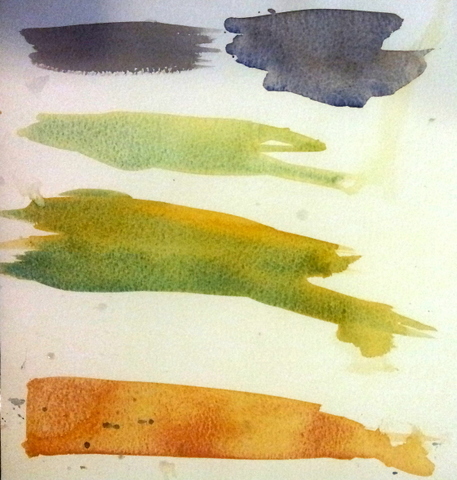 Of the many colours that granulate, Colin chose some popular ones in combination to demonstrate the effect of granulation and colour separation. 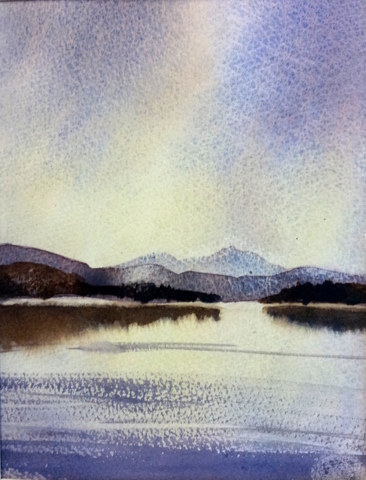 • Burnt sienna and french ultramarine blue. 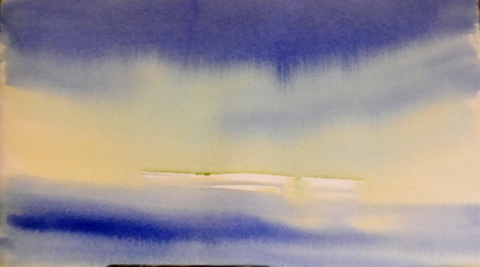 • Lemon yellow and french ultramarine blue. • Raw sienna and cerulean blue. • Cobalt violet and raw sienna. 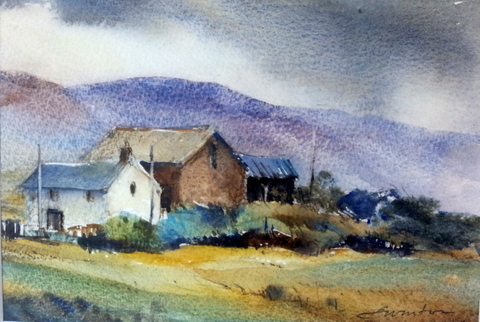 As a demonstration painting, Colin chose a cottage scene. It was roughly drawn to create interesting shapes. He started with some brown on the cottage. 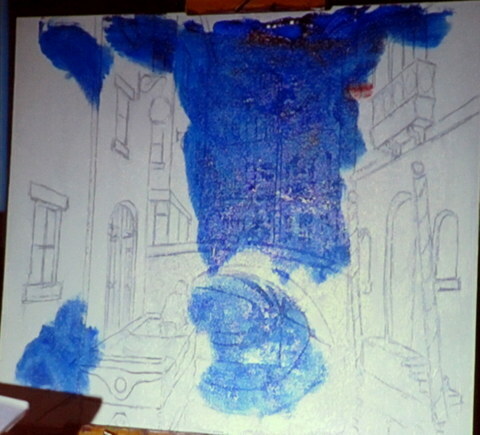 He then made a wet wash sky using two mixes of blue and encouraged separation by tilting the paper to move the wet washes across the paper, adding dark colours to create more interest. 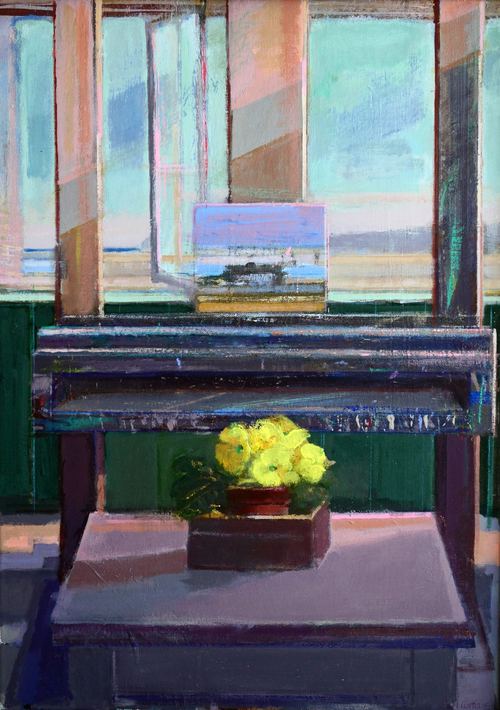 He painted the foreground in yellow and added darker dry brushwork for a textured look. The cottage was brought forward with the dark green trees and a graduated red across the roof. 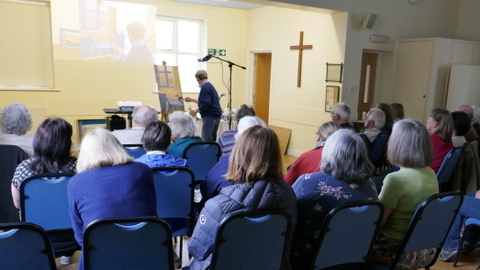 Successful local artist Neil Simone gave an illustrated talk on his “45 years as a painter” using the new overhead camera, microphone and projection system. Neil talked about about his career from graphic design and as a self taught painter in Wembley, moving to Harrogate, then setting up in Whixley and today in Glasshouses. Even though his early paintings in a variety of styles sold they were not distinct enough to enable him to have a one man show. He learnt from this difficulty, listened to curators advice to paint what interested and inspired him. He developed a unique style of altered reality, merging landscapes and domestic features with an element of fantasy. One of his many ideas was his easel illusion. This is a painting apparently on an easel with further levels of the illusion of paintings stacked in front, as illustrated. This is all painted on a thin flat board. This opened up further opportunities to display in galleries. 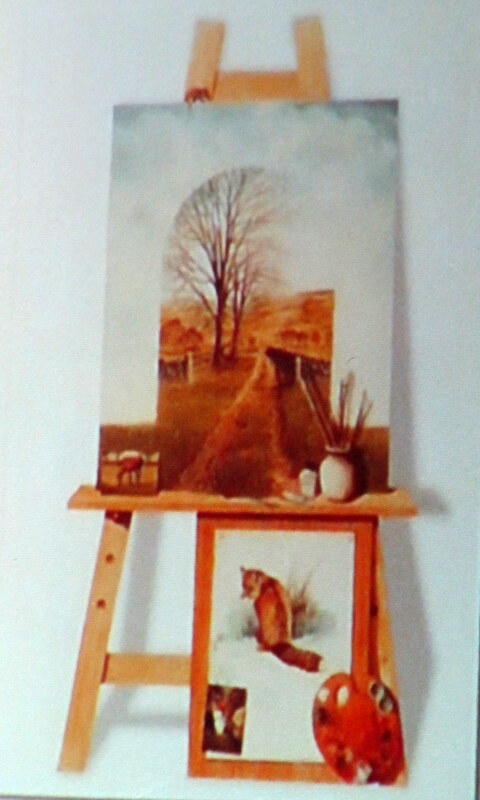 He repeated this format to make further large “easel” paintings and some in smaller sizes. His many ideas in his unique style of multiple images in ambiguous combinations have lead to national and international interest. 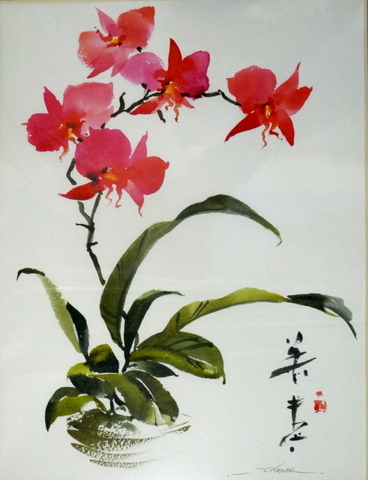 His paintings have sold world wide. He increased his sales with quality prints at affordable prices. 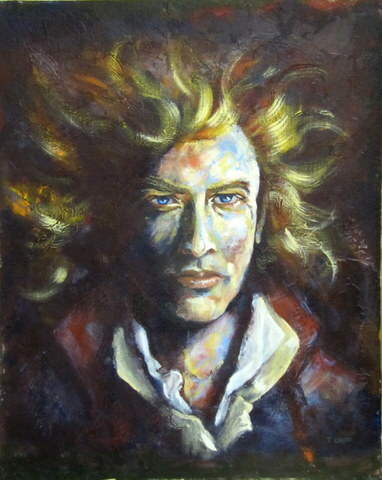 Neil paints in traditional oils on gesso surfaces and on smooth clay board. He uses low odour thinners and Liquin to enable him to paint smoothly with watercolour brushes to give better control than traditional stiff hog hair brushes. Liquin also reduces the long drying time of traditional oil paintings. 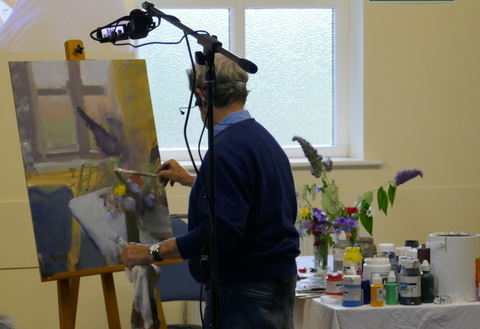 He uses a mahl stick to rest his painting hand above the painting surface to keep control of the fine brushstrokes. 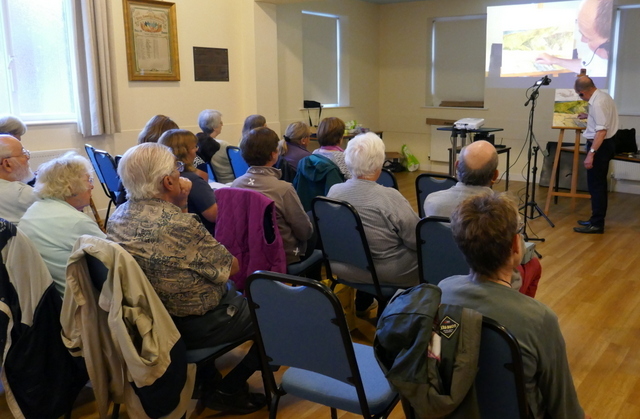 Neil gave a short demonstration of trees in a grassy landscape. 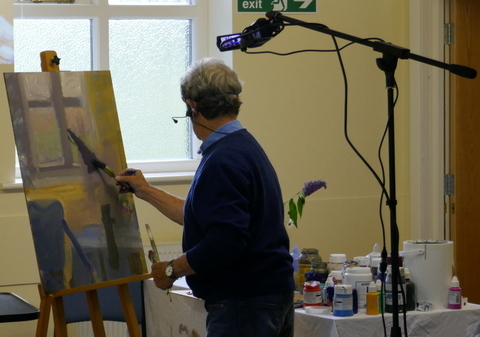 He showed how diluted oil colours could be easily mixed together, moved around and blended on the surface to make varied colours and textures.